With yellow chain up 6 stitched and then join up into a ring with a slip stitch. Then single crochet into that ring 7 times, slip stitch into the first stitch and then cut the yarn. Switch to the white yarn (or whatever color you like) and chain 1 and them work into the same stitch *1 double crochet, chain 1, 1 double crochet and 1 slip stitch* Repeat that into the other 6 single crochets. Cut yarn and sew in the loose ends. 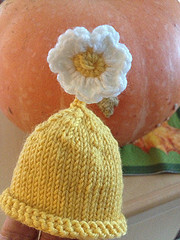 CO: 40 stitches and join in the round distributing the stitches evenly on the DPN’s. 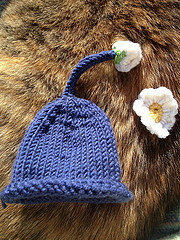 Then just knit or work whatever pattern you feel like till the hat is about 4-5 cms long before starting the decrease rounds. 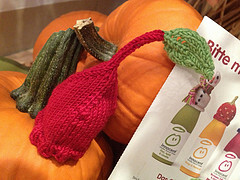 In case you are wondering why somebody would actually bother to knit hats for a smoothie, the whole thing is basically a charity thing. (And also lots of fun.) 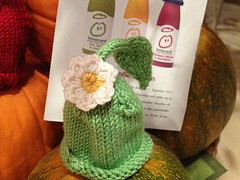 For every smoothie that is sold wearing a self knit hat 30 Cents are donated to help elderly people through the winter.